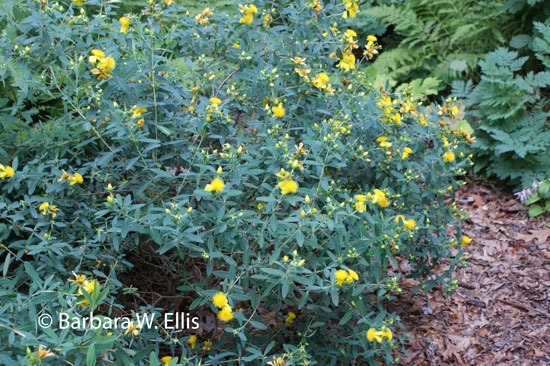 If you are looking for shrubs that produce super-early spring flowers, the choices are limited. Spicebush (Lindera benzoin) is my favorite native in this category. Before the Nor’easter passed through last weekend though, a non-native resident of my shrub border that runs along the road caught my eye. 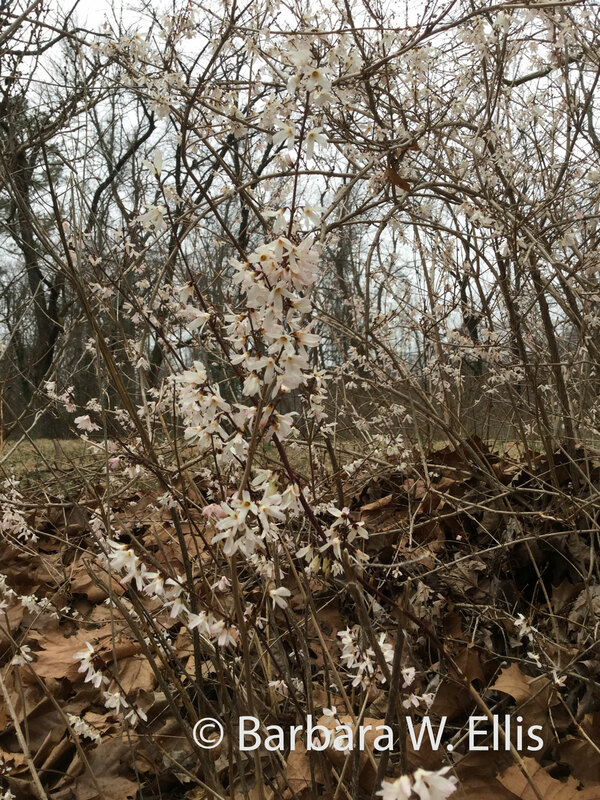 Commonly called white forsythia or Korean abelialeaf (Abeliophyllum distichum), this small, somewhat scraggly, shrub produces clouds of dainty white flowers in late winter. The flowers, sometimes blushed with pink, appear before the foliage. Although far less showy than the yellow forsythias (Forsythia spp.) that are scattered across spring landscapes everywhere, white forsythia does grace the garden with very early spring flowers. Plants grow in full sun to partial shade and need well-drained soil. Beyond that, they need little care. Prune as needed immediately after flowering to keep the shape dense. Plants do spread a bit by suckering, and they range from 3 to 5 or more feet high and wide. Descriptions I have read about Abeliophyllum distichum say the flowers are fragrant, but I can’t detect any fragrance. This is possibly due to the fact that my plant is out along the road and all the fragrance is lost in the wind. 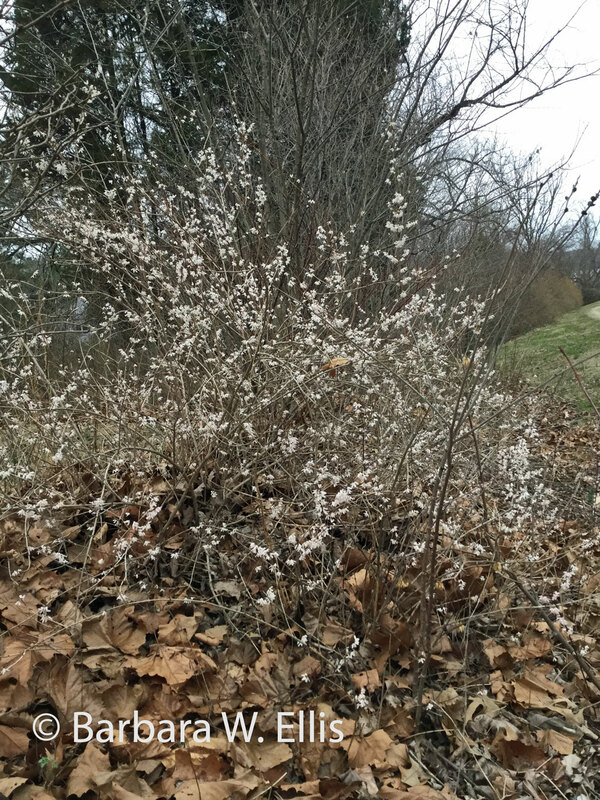 Still, the clouds of tiny white flowers are a promise of spring to come! I manage a local community garden, and this season I tried out an heirloom crop that I have never grown before—or heard of for that matter: Dragon tail radishes. As their name suggests, they are related to true radishes, along with turnips, garden cress, and other popular crops. 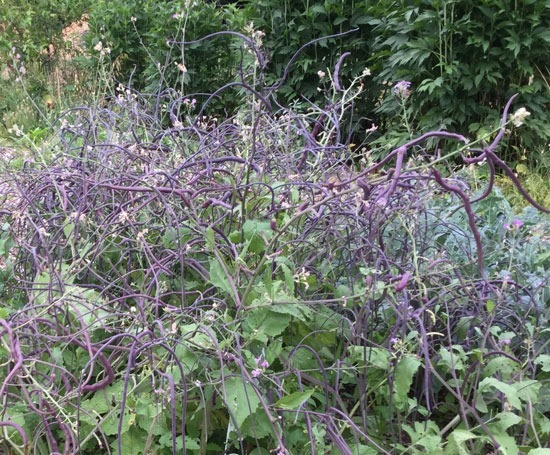 Unlike radishes and turnips, though, dragon tails are grown for their tasty purple seed pods. Thus far, I have used them to add a zesty radishlike tang to salads and stir fries. They also can be pickled. ABOVE: Pod production on our plants got ahead of us this week, because I’ve been away visiting gardens with the Annapolis Horticultural Society. Nevertheless, I picked several pounds to deliver to St. Martin’s Ministries food pantry tomorrow. There will be more pods ready to pick on the plants in a day or so. 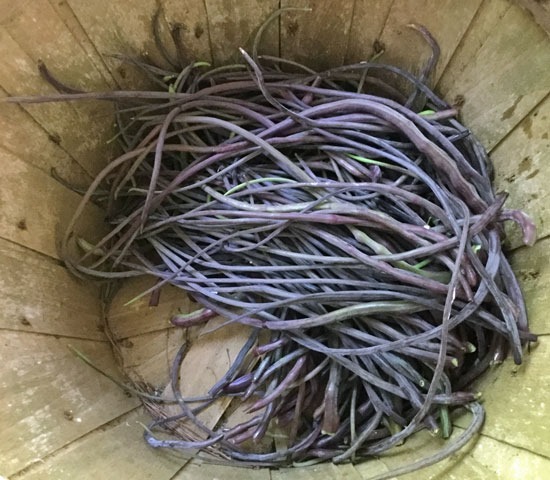 Above: The pods are best picked when they are slender—less than the width of a pencil, although if you like your salad or stir fry ingredients on the spicy side, slightly thicker is fine. Length can vary from about 3 inches to more than 12 inches. The crisp, tender pods have a radish-like taste. The best pods are much thinner than green beans. As they become thicker and longer, they become spicier. The largest ones are quite hot. In my kitchen, I use the really slender pods fresh in salads. Slender pods also are fine in stir fries. The thicker, spicier ones taste great in combinations that feature garlic, hot sauce, and other similar ingredients. Dragon tail radishes couldn’t be easier to grow. Give them a spot in full sun, average soil, and direct sow seeds right in the garden. Water regularly until seedlings are up. Plants spread 1 to 2 feet at maturity, so thin seedlings accordingly. I have found that plants grown in a singe row, rather than a block, are easier to harvest. Mature plants are about 3 feet tall. You can prune out older branches to keep the plants blooming through the summer months. The plants are really stunning, and this heirloom crop would be right at home in a flower garden. I wish I had remembered to take pictures of the plants at the peak of bloom, when seedpods were just beginning to appear! Not only do the plants produce clouds of white and pinkish flowers that wave in the breeze, the purple pods and stems also are attractive. Furthermore, the flowers attract loads of butterflies. Yes, our plants primarily attracted clouds of cabbage white butterflies, but still they are really pretty! I would like to thank Burpee Seeds for sending me seed of dragon tail radishes to try in the garden. Several other seed houses, including Baker Creek offer a similar crop called rat-tail radishes, which produce green seedpods. Above. 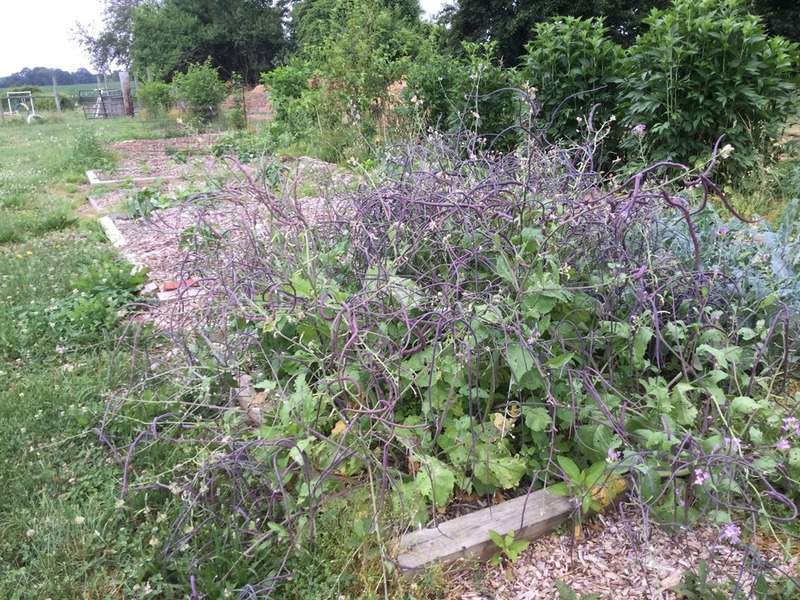 Our plants growing at Victory Farm Community Garden, just before today’s harvest. Tomorrow, they are getting pruned! If you are interested in volunteering in our garden, send me an e-mail! Whether I have been writing e-mails or delivering a gardening talk, one of my favorite hollies inevitably comes up once the conversation turns to plants that should be more available: American holly (Ilex opaca) ‘Maryland Dwarf’. Any of you who have tried to buy ‘Maryland Dwarf’ will know that it is difficult, if not impossible, to find. Above: ‘Maryland Dwarf’ holly (Ilex opaca ‘Maryland Dwarf’) at Mt. Cuba. Unlike standard-size hollies, this is a true shrubby ground cover. 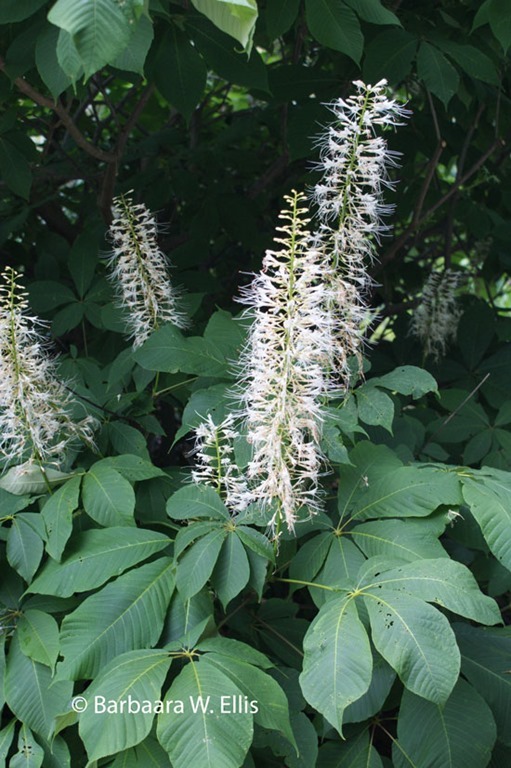 Plants range from 3 to 5 feet tall and spread to 6 or 8 feet. My own plants are considerably shorter—all are under 3 feet. They have handsome, glossy, evergreen leaves. Plants produce very few berries. I have two plants in shade and one in fairly full sun. ‘Maryland Dwarf’ makes a handsome ground cover for shade, a specimen in the shade garden, a companion for low-growing perennials or ground covers that won’t swamp it, or a component of a shrub border. So, I hope that those of you out there who have been wanting to try this great plant will swing by Priapi’s in Cecilton! Now Vic, how about some dwarf white pines? One of the great perks of being a garden writer are the boxes of sample plants that arrive on my doorstep each spring. All find a place in my garden, but today I wanted to call attention to one of my current favorites: Helenium ‘Short ‘n’ Sassy’. My clump has been blooming nonstop since late June, and it doesn’t show any signs of stopping since plenty of new buds are still forming. ABOVE: Helenium ‘Short ‘n’ Sassy’. Instead of clipping off spent flowers to produce a more polished-looking photograph, I shot the plant “as is,” with spent blooms in place. Also note new buds that will keep the color coming. A long-lasting bloom season is certainly one outstanding characteristic, but compact size is another. My clump is 2 feet tall and shows no sign of getting any taller. Admittedly, it is slightly taller than the 12 to 18 inches described in the plant description sent with my box of samples, but I am still quite happy with the plant. I am sure it would be easy to encourage more compact growth by pinching the stem tips in late spring. A site in full sun would also probably yield shorter plants. My plant receives about 6 hours of full sun—slightly less than 8, which is the generally accepted minimum for full sun. Flowers are one and three-quarters inches across. Orange petals surround brown centers. The exact shade of orange varies from flower to flower, but generally ranges from soft orange to orangy yellow. One bloom is red-orange. The exact parentage of ‘Short ‘n’ Sassy’ is not known, because the original plant was discovered as a seedling. Whatever its parentage, ‘Short ‘n’ Sassy’ is of native origin. Common sneezeweed (H. autumnale) probably played a role, but one of the more other species—there are 40 or so in all—may also be involved. H. autumnale is found throughout North America, and other species extend the range of heleniums to Central America as well. 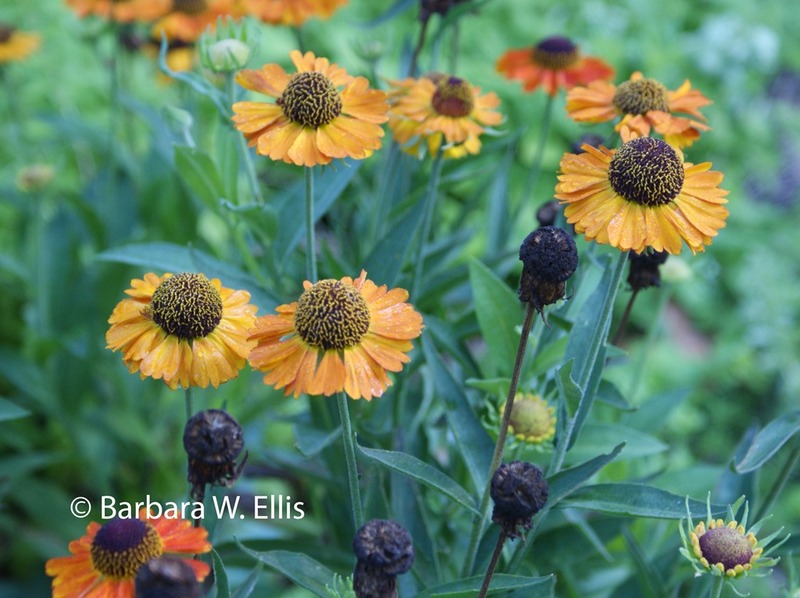 While common sneezeweed plants range from 4 to 5 feet in height, compact cultivars that stay around 3 feet are available. The genus contains annuals, biennials, and perennials, some of which are shorter and may have contributed to the height of this selection. 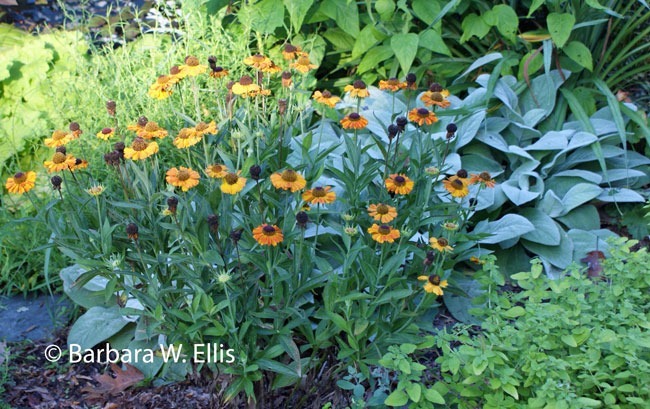 Because sneezeweed is an unappealing common name, I prefer to use the botanically given name—helenium—for all members of the genus. ABOVE: This clump is the second season from a sample plant that arrived in a 3-inch pot. Next year, I may experiment with pinching the stem tips to encourage branching and bushier, more compact growth. While I have places for taller heleniums elsewhere in the garden, ‘Short ‘n’ Sassy’ fits perfectly in my front garden. There, I have tried to avoid any plants (other than shrubs and trees) that are taller than about 2 feet. This minimizes the need to stake, which is not one of my favorite chores. The height restriction also makes the garden very pretty when viewed from down on the driveway. 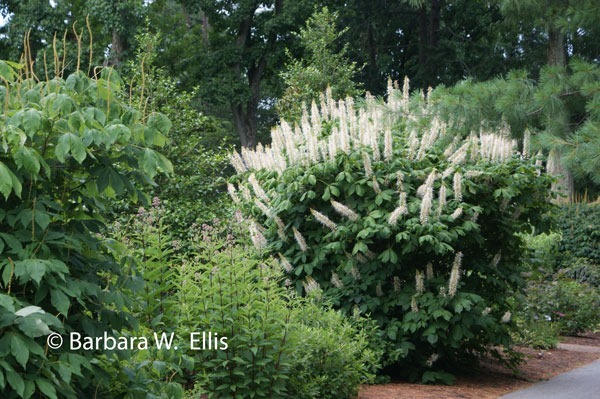 When walking along the narrow paths that run through the garden, having all lower-growing perennials and annuals creates an appealing carpet of foliage and flowers. 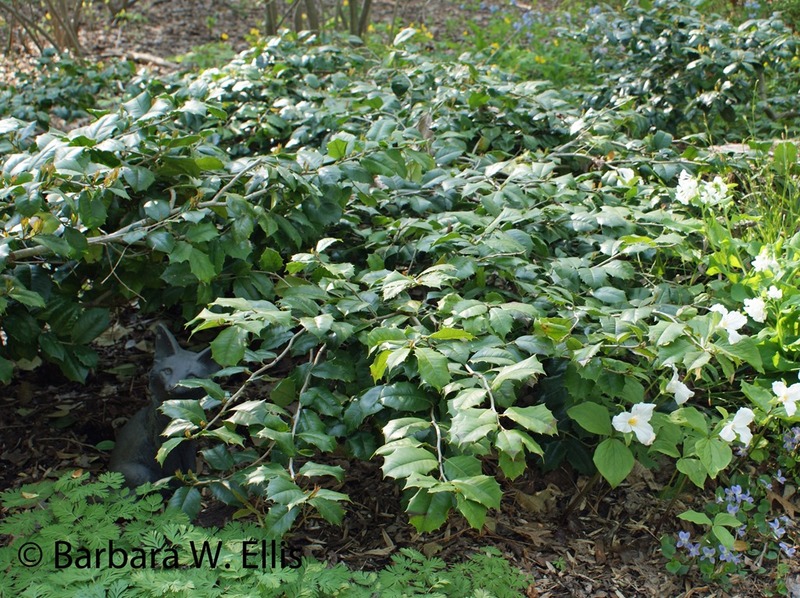 Everything in the garden essentially functions as ground cover. I have Skagit Gardens’, a wholesale grower that always sends an interesting selection of plants, to thank for adding this appealing native to my garden. My sample plant arrived on my doorstep as a tiny plant in spring of 2013. It produced a small clump by midsummer of its first year, along with a few flowers. This year it is well on its way to becoming a permanent and cherished resident. The clump is healthy and has expanded nicely with minimal attention. It has an attractive mounding shape, and is adaptable to a wide range of soils. The flowers are especially handsome with bright summer flowers in shades of orange, yellow, and blue. Daylilies are especially prominent just now and make good companions. I also have a handsome unnamed dahlia cultivar that is attractive as well. The dahlia slightly exceeds my 2-foot limit but is worth it for its yellow daisylike blooms and showy maroon foliage. Consider adding ‘Short ‘n’ Sassy’ to beds and borders where standard-size heleniums would be too large. It is small enough to use in large container gardens, and short enough to consider as an edging or a spot at the front of a border. Wherever you use it, the long bloom season, tough constitution, and compact size are valuable assets! Oh, and the flowers are attractive to butterflies and other pollinators, so what do you have to lose? 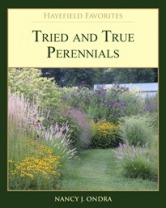 Anyway, if I’m completely on board with any plant that Nancy recommends, and this book features 20 of the best performers from her garden. I grow a number of them already, although undoubtedly not as well as she does, and the rest just jumped to the top of my list of plants to add to the garden. I should mention that Nancy gardens near Quakertown, Pennsylvania, so her recommendations are all suitable for our region. Let the Plant Shopping Begin! Although we’re surely not through with cold weather, the character of recent storms in addition to the calendar indicate spring is on its way. 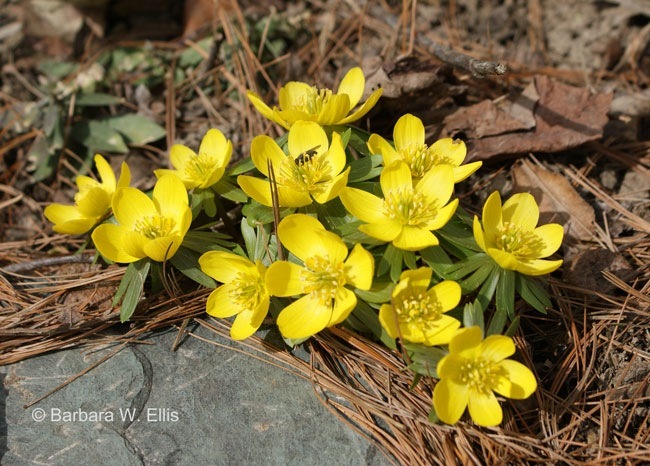 Plus, I have winter aconites (Eranthis hyemalis) and snowdrops (Galanthus nivalis) in bloom in the garden to seal the deal. For me the gardening season starts long before my hellebores get their late-winter haircut. (This year, I chopped back the old foliage the last weekend in February.) I usually mark the beginning of the season when I place that first order for seeds or plants, but this year was different. My husband and I were driving back from a trip to Florida to visit my mother. As is our pattern, were traveling the back roads as much as possible. (Has anyone out there read Blue Highways, by William Least Heat-Moon?) We took Route 301 most of the way from Georgia, and got to watch spring creeping up the eastern seaboard, as redbuds, camellias, clumps of daffodils, and magnolias came into view along the roadside. So, I was already thinking about gardening when I realized with a slight detour we could pass near Raleigh, North Carolina, home of one of my favorite mail-order suppliers, Plant Delights. In addition to a couple of mysteries for reading material during the trip, I had tucked their catalog (among others) in my bag. A glance inside the cover verified one of their spring open houses fell on the very day we were traveling through the area. (I swear there was no pre-planning on my part!) My always-accommodating husband was more than happy to devote half a day so I could visit the garden and shop. His only worry was that we wouldn’t have room to transport all the plants I bought. In an effort that is completely out-of-character for me, the night before the open house I actually made a detailed list of what I wanted to buy. In addition to re-reading catalog descriptions, I reviewed the long, on-line list of internet- and Open-House-only offerings. While I normally love to wander through a nursery picking and choosing, my list provided invaluable direction as I shopped. It’s so easy to get smitten by lovely and interesting plants at every turn—ones that may or may not do well in or make sense for your garden. With list in hand, I mostly stayed on the straight and narrow. Yes, there were plants I simply couldn’t resist, including variegated bellwort Uvularia perfoliata ‘Jingle Bells’, but what’s shopping for if you can’t splurge?